Used and recommended by major firearms manufacturers, Lucas Hunting Gun Oil is a special blend of oil and petroleum-extracted additives producing an all-weather, odorless lubricant. Its odorless formulation is a must for use on hunting firearms. The polymeric film protects metal from rust, wear and moisture during all hunting and shooting conditions. Applying Lucas Hunting Gun Oil to the bore and action makes clean-up of powder residue, copper fouling and wad fouling a much easier task. It resists burning off many times longer than conventional gun oils. Lucas Hunting Gun Oil cuts through rust and frees stuck parts and actions. It neutralizes acids from fingerprints to help prevent rusting. Lucas Hunting Gun Oil resists drying for long term storage use. 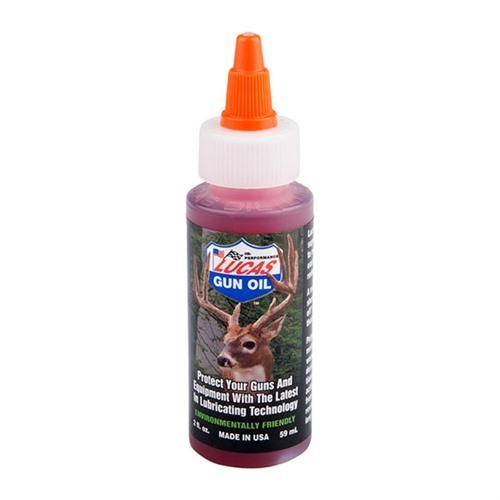 Lucas Hunting Gun Oil is great for general lubrication on all your sporting firearms and compound bows. Environmentally friendly. Odorless. Excellent for long-term storage. Excellent household oil. One thing that really bothers me is to go to the range with my handgun and fire 100 plus rounds and then check the barrel and all of the oil has burned off. This product solves that problem. I have shot as high as 250 rounds and this oil is still there, doing what it is suppose to, lubricating. This oil will not evaporate. You will not be disappointed. Lucas gun oil does it all on my bench. It has a heavier weight than most gun oils and just seems to lubricate and last longer when applied to working parts. Also, it does an excellent job removing rust when used with a scotch brite or stainless wool pad. For the range, it is easy to carry and apply on the spot as needed. Seems to hold up well on military firearm actions and automatics. The red tint helps you see where it goes and I've seen no impact to blued finishes or parkerizing, although I don't use it as a wipe down on my firearms. I have been using Lucas products for years from race cars to tractor trailers with great results. when I first saw they were making gun oil I had to try it . Well they hit a home run again. Everybody that I let try some has switched. Most of my gun club now uses this. I did not buy mine from Brownells because I've been using it for over a year now, but I now know what to add to my orders when your just a little short on that shipping deal. THANKS BROWNELLS for doing it again. I am glad to see Brownells is selling this oil. I have used it for years and always had to search for it in shops. This is about as odorless as I have ever seen an oil that has actually worked. I use it hunting and am very pleased. It works very well, doesn't seem to attract crud and dirt and lasts a long time. I just ordered some of the new Lucas Extreme Duty oil and look forward to trying it too. It's kind of cool to use Lucas Oil in your truck and on your gun. Keep up the good work. I bought three bottles for my hunter friends. They will be very happy. I will buy more Lucas hunting oil on every purchase I make from Brownells. I use Lucas gas treatment in my truck. Lucas Oil company is over 110 years old. Top notch stuff. The Lucas Heavy oil is the best on the market for any firearm.. I like the smell too. I am buying a gallon on Lucas Heavy next month. Mfr Part: 10006 Used and recommended by major firearms manufacturers, Lucas Hunting Gun Oil is a special blend of oil and petroleum-extracted additives producing an all-weather, odorless lubricant. Its odorless formulation is a must for use on hunting firearms. The polymeric film protects metal from rust, wear and moisture during all hunting and shooting conditions. Applying Lucas Hunting Gun Oil to the bore and action makes clean-up of powder residue, copper fouling and wad fouling a much easier task. It resists burning off many times longer than conventional gun oils. Lucas Hunting Gun Oil cuts through rust and frees stuck parts and actions. It neutralizes acids from fingerprints to help prevent rusting. Lucas Hunting Gun Oil resists drying for long term storage use. Lucas Hunting Gun Oil is great for general lubrication on all your sporting firearms and compound bows. Environmentally friendly. Odorless. Excellent for long-term storage. Excellent household oil. Mfr Part: 100006CASE Used and recommended by major firearms manufacturers, Lucas Hunting Gun Oil is a special blend of oil and petroleum-extracted additives producing an all-weather, odorless lubricant. Its odorless formulation is a must for use on hunting firearms. The polymeric film protects metal from rust, wear and moisture during all hunting and shooting conditions. Applying Lucas Hunting Gun Oil to the bore and action makes clean-up of powder residue, copper fouling and wad fouling a much easier task. It resists burning off many times longer than conventional gun oils. Lucas Hunting Gun Oil cuts through rust and frees stuck parts and actions. It neutralizes acids from fingerprints to help prevent rusting. Lucas Hunting Gun Oil resists drying for long term storage use. Lucas Hunting Gun Oil is great for general lubrication on all your sporting firearms and compound bows. Environmentally friendly. Odorless. Excellent for long-term storage. Excellent household oil.